That’s not the first time I have listened to this strong assertion about the instant positive effect of managed burns, but I have to admit I still have questions, and am also uncertain as to which specific burn plan objectives I should develop for our property. First of all, I don’t understand how fire scarifies grass seed in the ground. Scarification typically refers to various methods used to modify or lessen hard or impervious seed coats, like those of Texas Mountain Laurel, redbud, plums, and so on. It’s true that some grasses like Eastern gama grass and even Plains bristlegrass have harder, heavier seeds. After-ripening (allowing the seed some time in the ground to completely mature or “cure” until conditions are favorable for germination) is typically what is most needed before grass seed will sprout, not scarification. Taking the time to go back and look at photos of our fields taken 6 years ago, I am pleased to see less bare ground, but we still don’t have robust wide-spread stands of perennial bunch grasses like little bluestem, Yellow Indian grass, or abundant side oats – all of which can be reinvigorated by having their old chaff and foliage removed by cool season burns. 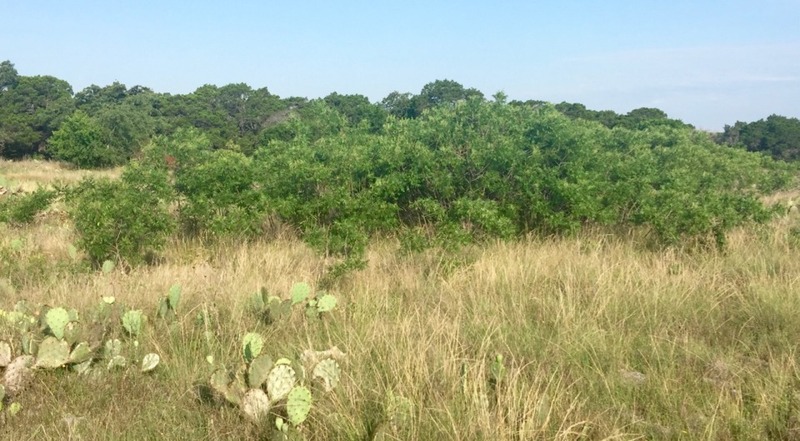 What effects would a burn provide our recovering grasslands? 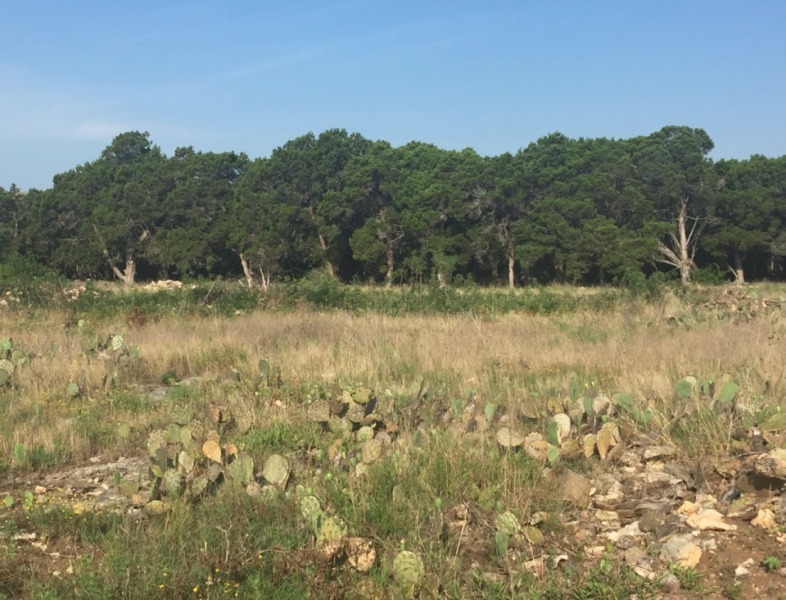 It would reduce competition from forbs, burn up organic matter, suppress but not eliminate, prickly pear, lote bush, mesquite and other woody plants that we would like to reduce. In the short term, it would reduce pollinators for some time (another unknown), and some of the important early foraging plants for browsing animals and turkeys. But would it stimulate grass seed germination? I don’t know. As I pondered how and when to use fire as an important management tool, it got me thinking how sometimes managed burns can result in unintended consequences that simply exchange one problem for another. On my frequent drives on Highway 71 past Spicewood, Texas, I’ve been observing the changes on the hillsides following the very hot fire and record drought that occurred in 2011. 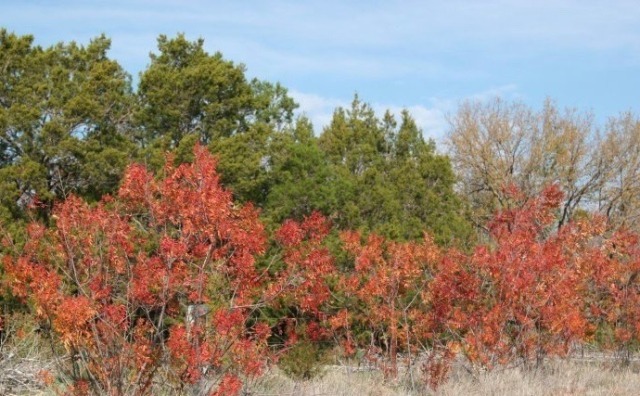 The hills were once dense stands of Ashe juniper or cedar, and after the fire, they exploded in solid thickets of prairie flame-leaf sumac (Rhus lanceolata). In the last two years, the sumac has been bulldozed twice for development, but it continues to re-sprout. 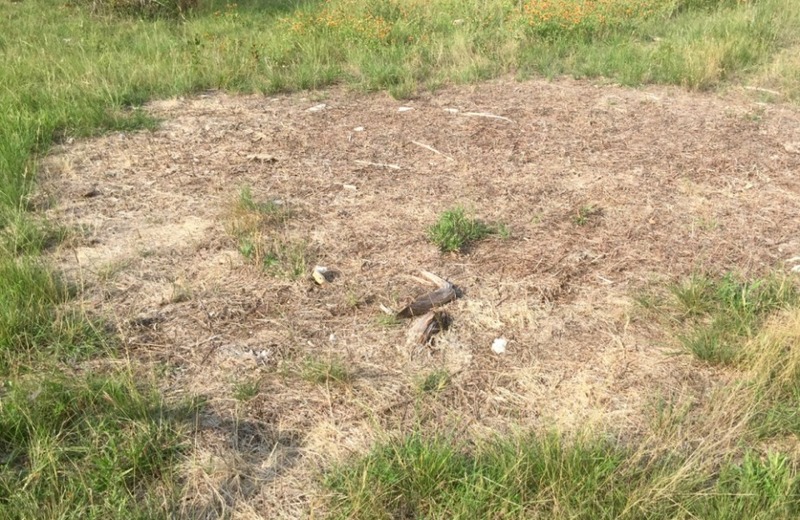 Last year I had the opportunity to study this phenomenon closer up on a property in Burnet County that is adjacent to the Balcones Canyonland Refuge. The landowners (C&J) had been able to participate in several managed burns conducted by the Preserve to reduce Ashe juniper, and to revitalize grasslands previously smothered by brush. Unfortunately, the fires also stimulated a massive germination of prairie flame-leaf sumac seeds, which in a short time have sprawled over areas that were momentarily cleared of the juniper. Now C&J have another problem on their hands: how to reduce the sumac that has taken over where the Ashe juniper used to grow. or openings in the canopy that allow light and moisture to reach the soil surface. piles produce a lot of ash, which is alkaline in nature. * post fire openings may be drought prone and subject to erosion. Sumac produces serotinous seeds and fruit. Serotiny is defined as the delayed opening of fruits or cones. This is an adaptation for timing seed dispersal according to the availability of favorable seedbed conditions. Many are familiar with the role fire plays in opening pine or cypress tree cones. In fire climax ecosystems, the cones open and disperse seed within days of being scorched by fires. Fire’s effect on sumac seed, particularly seed that has remained hidden and dormant beneath dense “cedar brakes”, has been less recognized as an important consideration in some areas, particularly when assessing post-fire management strategies. In the 1950’s, researchers noticed that germination of sumac increased after fire passed over the seeds, by reducing or modifying the hard seed coat so that moisture was then allowed to be absorbed by the seed especially when soil moisture levels were highest (i.e. winter). Managed burns also reduce immediate competition, giving the sumac a chance to get started earlier in the season. Why Does Sumac Form Large Sprawliing Clones? Sumac seeds are spread primarily by birds and mammals, and some scarification is achieved when the fruit passes through the digestive system of animals. Flame-leaf sumac becomes a problem when prescribed burns are frequently conducted and stimulate sprouting from underground rhizomes that form complex underground root systems. Along these root systems are many buds, each capable of forming a shoot up to ten feet tall or more. Each year produces more shoots, eventually resulting in a sprawling clone, with oldest stems at the center, and shorter stems at the perimeter. When existing clones are burned, this apical dominance results in the formation of new shoots from underground buds at the site of burned stems. In other words, subsequent burning or bulldozing just makes the sumac mad, stimulates vigorous re-sprouting from formerly dormant buds. Why is Sumac So Hard to Remove? 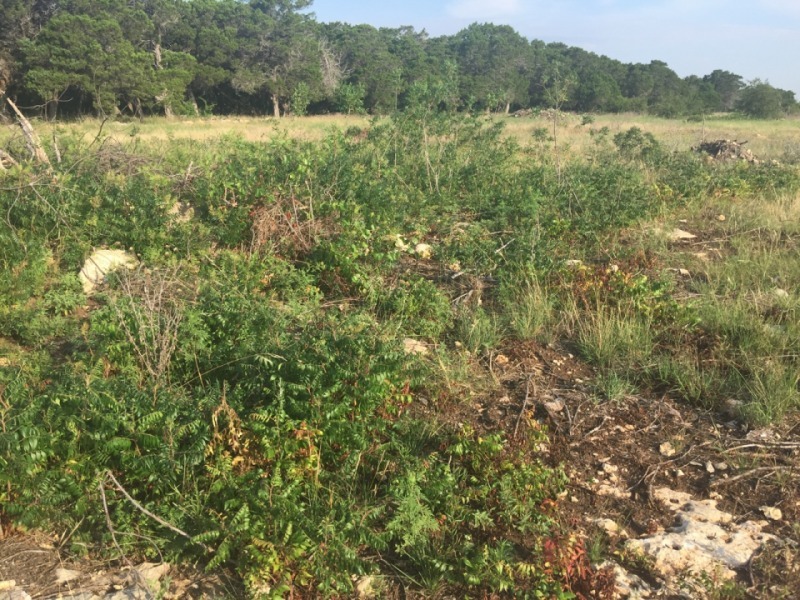 On this particular property in Burnet County, C&J discovered that their once-dense stands of cedar were being rapidly replaced by spreading clones of sumac. The aggressive colonization of sumac was not forecast by the burn manager as something they would have to be prepared for post-burn. Grubbing or bulldozing on rocky rangeland proved inefficient in removing all the rhizomes, and re-sprouting was exacerbated. On small clones, hand-cutting each stem and treating with triclopyr (Remedy is one brand name) will kill that one bud, but treatment has to be repeated on subsequent sprouts for three years or more. More daunting are the large clones in which individually cutting each stem quickly becomes a fool’s errand. 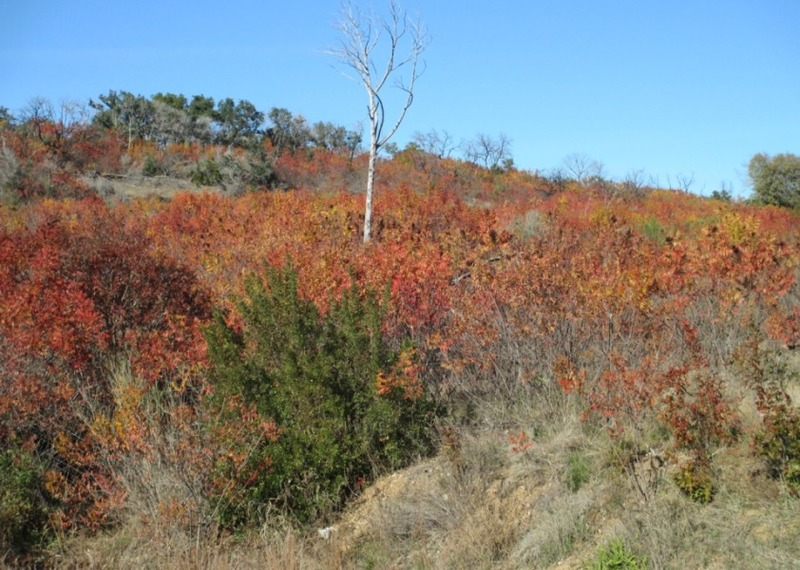 These hard-working landowners in Burnet Co. are continuing to experiment with various techniques of removing or reducing sumac coverage, and they now recognize this is a multi-year project. Some large clones will be left in place, as sumac is a valuable plant for browse and mast (fruit) production, and the dense clones provide cover on open rangeland. Yet like other plants, it is a matter of balance, especially on recovering rangeland. Monocultures of almost every plant come with a definite downside. Some techniques they may try are high-shredding the clones, and then spraying the frayed stems with triclopyr. Grubbing, shredding, hand-lopping and spraying in various combinations may also eventually be successful, though treatments will have to be on-going, because sumac recovers quickly. It’s a daunting job and certainly drains the joy from any momentary satisfaction of seeing all that cedar cut and burned. For me, the biggest take away message from C&J’s experience is how important it is to have realistic follow-through plans for management after a burn. It’s not a one or two day deal. It’s been said that under each Ashe juniper tree remain enough seed to germinate for 3-4 years after the main tree is cut, so understanding that ongoing cutting of small seedlings is an important part of the project. But how could C&J know that beneath those dense stands of cedar were millions of dormant, hard-coated sumac seeds just waiting for the hot smoky breath of fire to release them? Was this phenomenon readily visible on previously burned areas of the Preserve? Did the “burn boss” describe vigorous re-sprouting of sumac as part of a follow up protocol for burning? Yes, it’s always nice to know what you are getting into when you embark on an ambitious land management project, so you can ration your energy and money to be able to properly follow up. On the other hand, if we knew how hard everything was going to be, would we have started in the first place? If anyone out there has been successful in controlling large sumac clones, please let us know how you did it.